Welsh patients face a "markedly inferior" diagnostic test service compared to those in England, a Labour MP has said. Cynon Valley's Ann Clwyd cited rising figures of those waiting longer than six weeks to have an MRI scan, ultrasound or gastroscopy test. The MP has been vocal in her criticism of the Welsh NHS in the past. Welsh Government said those waiting more than eight weeks in December was 61% lower than in January 2014. Statistics obtained from the House of Commons Library by Ms Clwyd showed the percentage of people waiting for MRI scans in Wales for more than six weeks rose from 14.5% (1,884 patients) in November to 24.8% (3,092) in December. A total of 1.4% of patients - 2,517 - waited longer than six weeks in England in December for the same test. 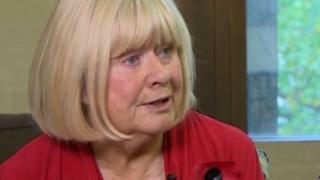 Ms Clwyd said the figures were "very disappointing". "It is simply unacceptable that patients in Wales have such a markedly inferior service to their English counterparts. "The long term effects of delays in diagnosis which result from this situation have real implications both for the patient's health and for the nation's health." Image caption Ann Clwyd said the figures were "very dissapointing"
Ms Clwyd said she would write to First Minister Carwyn Jones to ask what steps can be taken to oblige health boards to increase efforts on tests "as a matter of urgency". Other figures showed a total of 56.7% of patients (3,134) were waiting more than six weeks for gastroscopy tests in Wales, compared to 47.6% (2,614) in November. Just 4.1% (1,677) were waiting that amount of time in England. On non-obstetric ultrasound, people waiting more than six weeks rose from 16.9% (3,380) in November to 23% (4,524) in December. In England the figure for December for patients waiting longer than six weeks stood at 0.6% (1,740). A Welsh Government spokesman said: "Our target in Wales is a maximum wait of eight weeks with people waiting less than four weeks on average. "In December 2016, the number of people waiting more than eight weeks for specified diagnostic services was 61% lower than January 2014. "Actions are already in place to improve waiting times and we expect health boards to ensure that there will be no-one waiting over eight weeks for MRI, CT and non-obstetric ultrasound scans by the end of March." Ms Clwyd said in 2012 that her late husband Owen Roberts was treated "like a battery hen" at the University Hospital of Wales, Cardiff.